I made these for our family dinner this week. We were having lasagna and I wanted to serve something garlicky that was not garlic bread. I immediately thought of these biscuits. I had made them before and remember loving them. The final verdict from the adults was they loved them. Score! They are my kind of recipe because it’s quick and simple. It requires very few ingredients. Finally the taste is remarkable. Mix Bisquick and milk until moist. Add a little bit of milk at a time if needed. Drop heaping tablespoons of mix onto a cookie sheet sprayed with cooking spray. While biscuits are baking, melt butter in microwave. (I do a minute at a time until melted.). Stir in garlic and parsley. 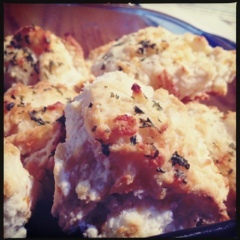 Once the biscuits are out of the oven, brush on the butter mixture. Last week I didn’t post a menu. I did menu planning though. This weeks a crazy week. I’m staying late one day, have a doctor’s appointment another day, and am doing something another evening. Needless to say I’ve got to make sure everything is ready for Hubby so he can get the boys and himself fed. I found this recipe in Erin Chase’s $5 Dinner Cookbook and have been using it for the past year or so. 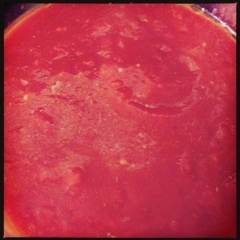 Today I was making lasagna for dinner and decided to make the sauce for it. Place all the ingredients in a sauce pan. Note: You may add 1 Tbsp. of white sugar or a shredded carrot to cut back on the acidity of the tomatoes or to add sweetness to the sauce. Yum! 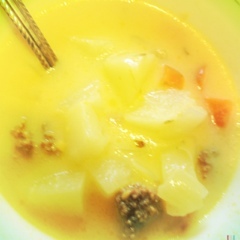 This soup is so good. Last weekend I was checking out meals matter. I hadn’t been on that site in forever. Anyway I found this recipe in my personal cookbook on that site. I decided it would be a good dinner. So I put it on our meal plan. Both the Imaginative One and hubby loved it! It was also easy to make especially if you have already browned hamburger in the freezer. Oh and the flavors will remind you of a cheeseburger with ketchup, mustard, and pickle. Brown ground beef and then drain. (Or use frozen browned ground beef from freezer). Add veggies and ground beef into big stockpot. Pour chicken stock over veggies and ground beef. Bring chicken stock to a boil. Reduce heat and them let simmer until carrots and potatoes are cooked and soft. About 15 minutes. Take off the heat. Add milk and cheese. Stir until cheese is melted. Add mustard, relish, ketchup, and bacon. Stir. Last fall, I bought doughnut pan with plans to make homemade doughnuts often. I made a few batches and the pan ended up in my oven drawer sitting there all lonely. Since it’s St. Patrick’s Day, I decided I needed to do something green related for a treat. I decided doughnuts would be a great idea. 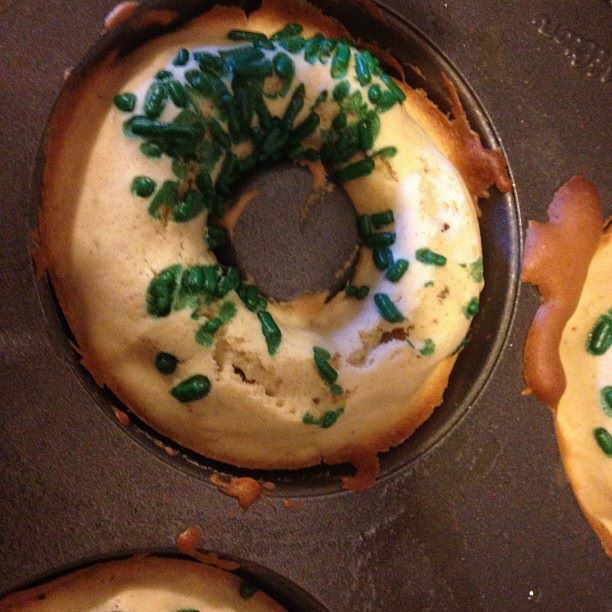 I could put green sprinkles on them to honor the day. (The boys think St. Paddy’s Day is the best holiday ever. They have been talking about the day for months.) So putting green sprinkles on the doughnuts would be awesome! After making them, I pulled them out of the pan. The Wee One thinks the Leprechaun in our house did it. He also thinks the Leprechaun ate one of the mini doughnut. I went to King Arthur’s flour for the recipe. This recipe is easy and delicious!!!!!!!! Preheat oven to 425 degrees. Grease doughnut pans. I keep saying I need to write a book on the some things I have encountered as a teacher. Some are endearing while others are just CRAZY. Friday was one of those CRAZY days. The third grade teachers were all at an inservice and I was left behind. The saying while the cat is out, the mice will play rang true ALL day long. Anyway, the other day a student asked me if I was 22 years old. My ego was inflated as I said “Yes!” with a lot of enthusiasm. A minute later, another student pumped up, “You look too old to be 22 years old. My ego deflated. Another student piped up, “You are 30 years old.” My ego was inflated once again. But then it was deflated when another student blurted out my real age. How they knew my real age, I don’t know. Yummy! Three ingredients that sound strange together come together in ooey, gooey deliciousness goodness. We had a family game night scheduled for my church. I decided to make a recipe from a while ago and a new recipe. I have Stephanie O’Dea’s slow cooker cookbook. This one of the recipes in it. Brown sausage and then drain. 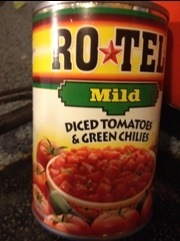 Place browned sausage, Rotel, and cream cheese in a 1.5 or 2 qrt. Crockpot. Cook on high for 45 minutes or low for 90 minutes. Back in August 2010, I was going to do a series about my favorite books or series. I only did one post and then didn’t do any others. Both the Imaginative One and I have read this series. This is one of his favorite series and loves to read me exerpts from the books all of the time. Imagine your favorite fairy tale characters were real and lived in a town called Ferryport Landing, New York. Your mother and father have disappeared without a trace and for a year and a half you have lived in foster care moving from one home to another with your sister. Suddenly a long lost grandma of yours is claiming to be your relative. But wait your mother and father have told you that she has died. Is this a trick? For Sabrina and Daphne Grimm, this is exactly what happens to them. They are transported to Ferryport Landing. There they discover their family is relatives of the Grimm Brothers who not only wrote fairy tales but also knew the characters personally. They brought them over from Europe to the United States. The ancestors of the Grimm Brothers have become fairy tale detectives. These stories will engage you as you discover a secret organization known as The Scarlet Hand, how Sabrina and Daphne react to being in the town full of fairy tale characters, and their adventures as fairy tale detectives. As the series continues, you will discover more evil plots by the Scarlet Hand. You will become sucked into the town of Ferryport Landing and into the lives of Sabrina and Daphne.